Altrincham earned a valuable National League point after recovering from a goal down against Chester. Michael Rankine struck Jon Worsnop's post before Chester's Danny Hattersley had a header cleared off the line. Ross Hannah broke the deadlock with a low finish after good work from Tom Shaw, before Ryan Higgins nearly doubled Chester's advantage. 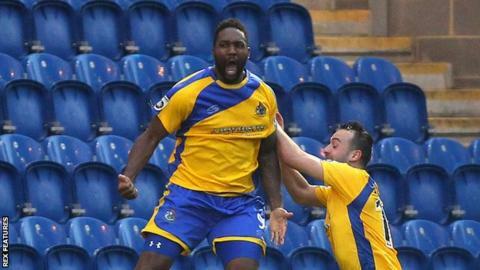 Rankine then found the net on the hour to equalise for Altrincham with a looping header. Altrincham, who knocked Chester out of the FA Cup at the fourth round stage in October, are now two points clear of trouble, in 19th, seven points behind 15th-placed Chester. "It's definitely a case of two points dropped. The game should have been killed off at half-time and the message at half-time was that one lapse in concentration could cost us and it did. "There were lots of chances. Our delivery into the box was excellent and we should have added to the one goal that we got. "If you don't put the ball in the back of the net you always risk drawing or losing a game, especially from a 1-0 position." Match ends, Chester FC 1, Altrincham 1. Second Half ends, Chester FC 1, Altrincham 1. Attempt saved. Michael Rankine (Altrincham) header from the left side of the box is saved. Foul by Steven Hewitt (Chester FC). Attempt missed. Steven Hewitt (Chester FC) right footed shot from outside the box is too high. Sam Heathcote (Altrincham) is shown the yellow card for a bad foul. Foul by Sam Heathcote (Altrincham). Attempt saved. Michael Rankine (Altrincham) header from outside the box is saved. Steven Hewitt (Chester FC) wins a free kick. Substitution, Altrincham. Sam Heathcote replaces Nicky Clee because of an injury. Substitution, Chester FC. Craig Hobson replaces Danny Hattersley. Substitution, Chester FC. Steven Hewitt replaces Luke George. Substitution, Altrincham. George Bowerman replaces Damian Reeves because of an injury. Goal! Chester FC 1, Altrincham 1. Michael Rankine (Altrincham) header from the right side of the box to the bottom right corner. Assisted by Jordan Sinnott with a cross.